The project has finished. The fencing has been taken down and the wardens are off site. 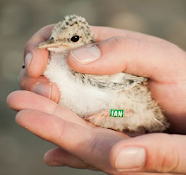 We are delighted that 2014 has been the most successful year on record for Little Terns in Kilcoole. I will be doing a blog post very soon with all the numbers and details of this excellent season. 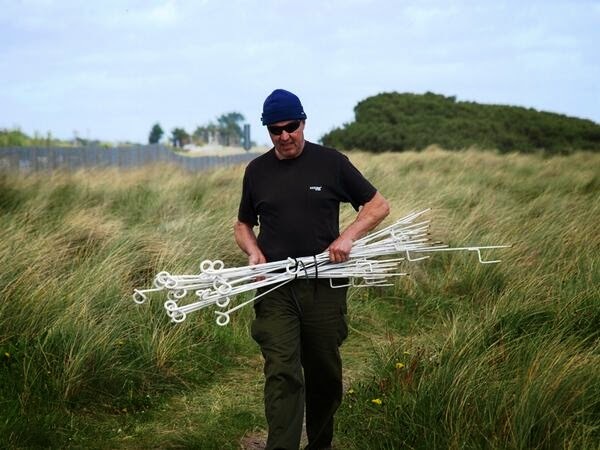 The following blog post has been written by Cole Macey, the night warden here in Kilcoole. I am sure that one of the major reasons for the success of this project has been because the involvement of Cole over the past 7 seasons. The graveyard shift can be a difficult and lonely job and it is vital to the success of the project. His blog post takes us through a typical night shift and nicely summarises the project from start to finish. Enjoy. Good mornin' Kilcoole! and to all you bloggers out there. Night warden Macey here (put that light out there's a war on!). My hours of duty are from 22:00 to 06:00. At 22:00 I take over from the day warden and the day warden takes over from me again at 06:00. We have a few mins of briefing re: any observations on activity taken place on my watch and then its good luck! The colony colours are red and black and the colony motto is "always alert, always ready". Each year we are proud to fly the colours and strictly stand by our motto. The first 2 weeks consist of bringing in all the fencing materials, signs, water bowser, portaloo and the 3 caravans across the causeway to set up camp for another project year. A tidy camp is a happy camp and a happy camp has a knock on effect to being a well run and managed project. The nights fly by. The secret is not to clock watch. The moon, stars and sunrise (unless it's coming down in stair rods) are all good indicators of time of night/day. Even without the parish lantern the streetlights from Kilcoole (northwest) and Wicklow town (south) are enough to give you good vision. The night without cloud cover will become dark at 23:00 becoming light at 03:15 (mid June). In fact for 2 weeks in mid June the northeast horizon at sea (if clear) will always have light. When the project is up and running the day warden hands over to night warden and vice versa the next morning. The project runs like clockwork and so it should after all these years. A mighty help though is to have the same team back year after year depending on their own commitments (we are only seasonal fieldworkers). The day wardens stay focused and alert, the night warden does the same during the vampire shift. Total commitment with good communication betweeen the 3 wardens for 3 and a half months is the secret to a successful project. We cannot dictate the weather or stop the sea, just look at the 2012 wipeout when all the eggs were taken by high tides and no chicks hatched, but everything else that falls in our remit we are ready for (ish!). Thankfully this year has been a relatively quite one for me. No foxes, feral cats, hedgehogs or mink during the night. Even the corvids at first light have behaved themselves after putting manners on them. I think I deserve this year after the commitment and worry of the last 6 years as to what night predators could be out there. Some nights can be as flat as a witch's what's its name. Other nights have the magic that a camera could not capture. For example, in June a full moon shimmers across the open sea to the east. The lights of Kilcoole dance across the still lagoon silhouetting 8 swans amongst a spooky mist. A mother and 3 Otter cubs playing and feeding in the lagoon just below the camp to the west. A Long-eared Owl silently passes through the camp looking for the many small mammals along the railway embankment. Time 2:30, seek and ye shall find. On another night on the 22nd of July a thick fog descended on the beach. A radio was placed at the north end of the buffer zone on a Radio 4 chat show. The radio was left on until the fog lifted at 02:00. This was just to keep predators guessing until the fog lifted. Every so often you go into the camp for a brew or 2 and a quick bite to eat. Keep the stomach happy and the mind is then happy (many a battle has been lost when the human soul is at it's lowest ebb during the early hours of the morning) but while in the camp you still listen out for the tell tale signs of trouble. 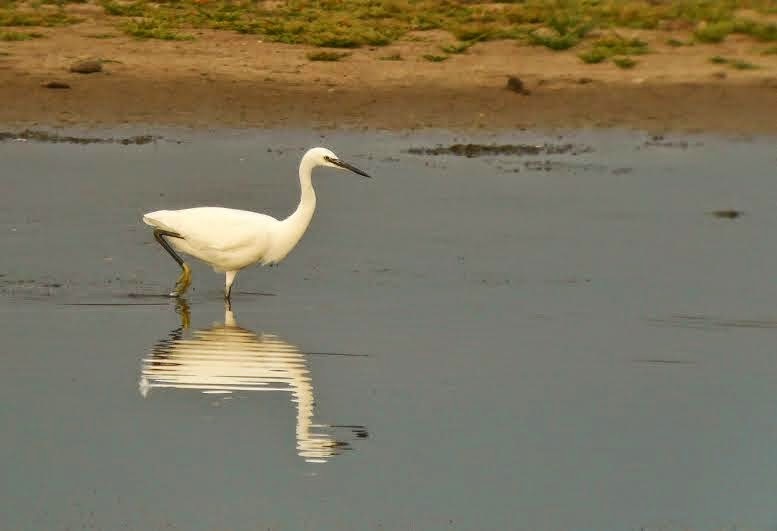 Each bird on the shingle or on the mudflats of the breaches lagoon have their own alarm/distress call from the Little Terns, Ringed Plover, Oystercatcher on the to beach to the Curlew, Heron, Egret, Lapwing and Swan on the mudflats. The night warden then responds. Always alert, always ready. View from Cole's caravan. Then there are the early mornings. Sunrise is something else to behold. Firstly a crimson red sky, then slowly up she rises, then bang a big golden gong. Couple this with the calm sea lapping the shoreline and a golden path straight to the colony. This is the tern hour. Just before the light comes the terns chatter amongst themselves up down the colony, north to south, south to north, but now at sunrise all the adults go out to sea fishing to bring food back to feed the hungry chicks. A very busy start to the day inside the colony. There is an old saying "time and tide wait for no man but here at world's end staring out to sea time does stand to still" (keep a weather eye on the horizon). The last week of the project I will revert back to days. The flexi net fence, electric fence, signs and string fence are all taken down in a particular order until there is nothing left. Everything reverts back to normal. The wardens path becomes public again, Kilcoole residents, visitors and dogs a like have the run of the entire beach again. Until we return again the following year with the Little Terns and strike camp and everything goes back across the camp in reverse order. And there we are playmates. I do hope you have enjoyed the quick glance through the night warden window on a typical project year. Take care out there, catch you on the next orbit.